Alexandra Palace and the Knitting and Stitchery show 2006. The great day has arrived! I have been so looking forward to this - and at the same time I can hardly believe it's October already. I set off with George's Mother, Sheila, as usual at around 7:45, driving through Richmond Park and up through Kew; it's lovely in the park at this time of year - the deer are rutting, (as we have been shown all week on the TV in "Autumn Watch" and can now see here without going up to Scotland). We finally arrived at the Palace in good time just before 10. They changed the parking again this year, so we were able to park in a nice little spot just at the back of the palace; I hope this does not indicate a lower attendance - they are running an extra event this year at the NEC and I would be sad if they abandon the London venue. 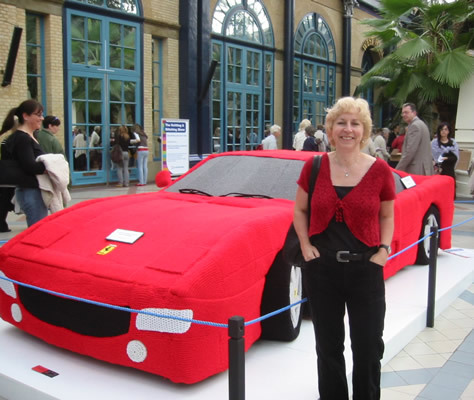 In the entrance hall we found an amusing exhibit; the Ferrari was entirely knitted, supported on a wire netting frame underneath. Sheila took my picture next to it. I am wearing "Elspeth" from Rowan 37. "Elspeth" is designed to be knitted in Calmer, which is a wool I like a lot, but I chose to use Debbie Bliss Baby Cashmerino because I wanted this true cherry red colour. Calmer is a sort of Aran weight yarn whereas the Cashmerino is 4 or 5 ply (quick knit, fine double knitting.... whatever). I ended up knitting it at least 4 times (due to my tension changes and because this style needs to be more tight fitting than I would choose normally) and had lots of fun with the crochet edging (because Rowan do not see fit to give you any guidance as to how many stitches to pick up - 1:1 is too many, and different ratios apply according to which part of the edge you are doing). I also knitted it about an inch longer than designed. All this effort on "Elspeth" was well worth it as both Debbie Bliss and Jane Waller commented on how nice my knitted top looked (dog with 2 tails, I was). I must say what a really nice lady Debbie Bliss is - she, and her companions on her stand, are so cheerful and pleasant and seem really interested in everyone's satisfaction in their knitted projects. Two or three years ago at the show, I purchased both pattern and wool for a cardigan, entirely because of her attitude and her encouragement to try the display model - she also gave me lots of good advice as to what size it was knitted in and how it might differ from the pattern. I cannot emphasise enough how good it is to see your favourite designers making what must be such an effort with the public. I remember Kaffe Fassett years ago responding, with such good grace, to an audience asking him endless questions about knitting rather, than what he is really skilled in, which is design. I had not met Jane Waller before, and she is also simply charming. It seems that, unbeknownst to me, she is a ceramicist mainly but I know her from her books on knitting. She specialises in reproducing old patterns and showing them knitted in modern wools. I purchased her books in the 1980s "Thirties Family Knitting Book" and "A Stitch in Time". I found her at the show in the Woman's Weekly Cafe with a fantastic display of knitted items from her new book "The 1940s Knitting Pattern Book"; she also had some of her source materials on display: Stitchcraft magazines - how wonderful! Irritatingly for her, the publishers had failed to publish her book in time for the show, or I, for one, would have taken it at once! It is due to be published on October 27th. She did mention that she would like her old books to be republished, and I can only whole-heartedly agree - they seem to change hands on eBay for tidy sums. The show this year had, as expected, far more emphasis on wools and fibres than in previous years. When we first came about 6 years ago, at Sheila's instigation, it included the Quilt Show, but this has now moved to an event of its own run in August. There are still enough fabric stalls to interest Sheila, though, and she thinks she might do more knitting in the future - last year we attended a crochet workshop at the show but none of these events interested us this year. 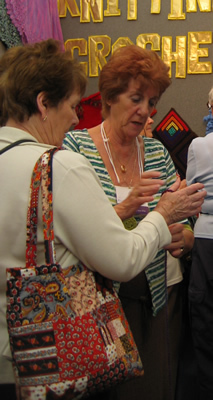 See Sheila, left, (note snazzy quilted bag), at the Knitting and Crochet Guild learning finger knitting. I notice that the fibres and general thrust of the show is less oriented towards knitting conventional clothing, but far more towards fibre art work, with specialist fibres available in tiny quantities, more suitable for, say, embroidery, weaving, felting etc. In the extended entry see photo albums of the show, and a felting demonstration. Click on the thumbnails for larger views. After the foggy start to the morning, this was the fantastic vista from the palace when we left at 5 o'clock. We could see the Gherkin, the Post Office Tower, the London Eye, and, I think, St Pauls. Don't strain your eyes to check, though, as only the Gherkin is visible in this picture, (in the middle of the 2 trees on the right). See many more photos from the show below. Here are some pictures of the show - click on the thumbnails to page through the album. If you have a video-enabled browser, you can roll the cursor over the picture below for a little animation.